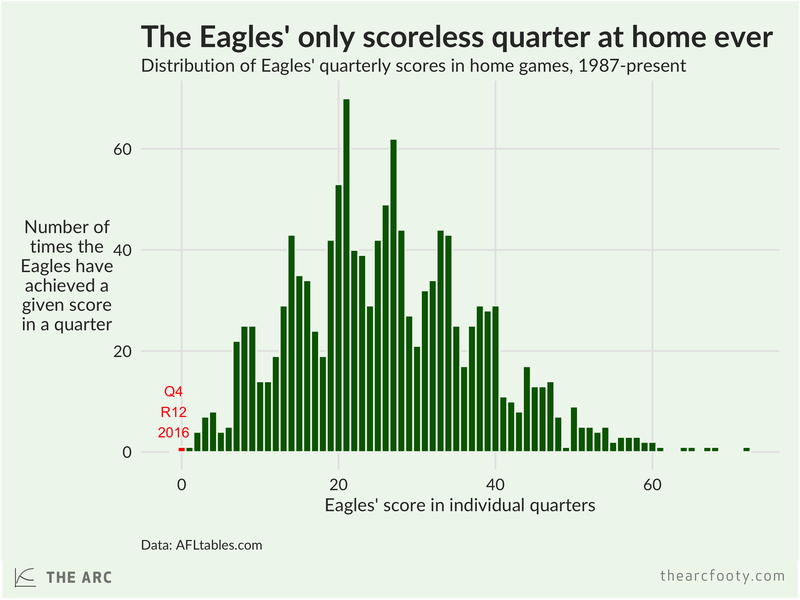 The Eagles just failed to score in a quarter at home for the first time ever. They headed to the three quarter time break at 11 goals, 10 behinds, and failed to add to that total in the final quarter. This is the West Coast Eagles’ thirtieth season in the AFL/VFL, during which time they’ve played 1 296 quarters at home, not including home finals. In all of those quarters, the worst they’d ever done until this weekend was when they scored a single point against the Kangaroos in the second quarter in Round 11, 2014. Today’s match against the Crows was the first time the Eagles have had a scoreless quarter, at any ground, since 20 August 2005 against Geelong at Kardinia Park.